One of the things that I love about traveling is how it influences my cooking. I came home from our trip to Maui with a sheet of paper filled with recipe ideas. I’ve already shared my Papaya Rawnola Bowl recipe with you, but there are more coming! 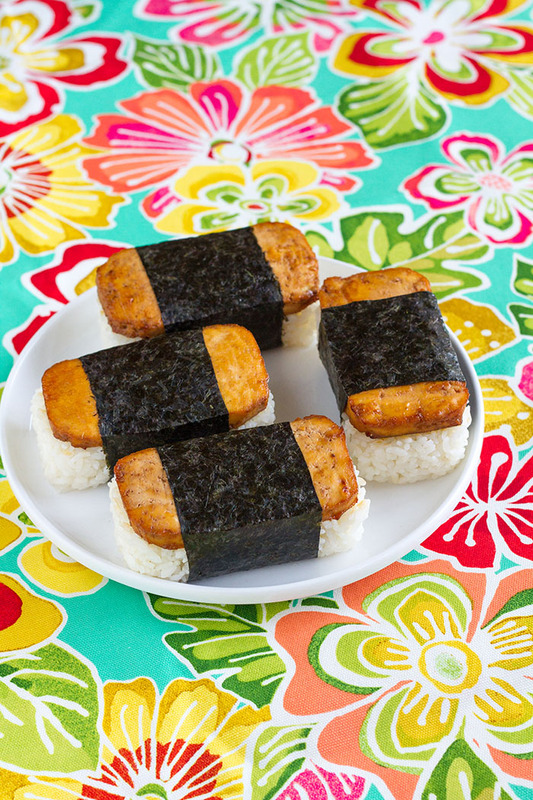 Today I’m sharing my recipe for Tofu “Spam” Musubi—a play on the Hawaiian spam musubi favorite. Spam musubi was created during World War II by Japanese Americans living in the internment camps and quickly became popular in Hawaii. It is now a popular lunch and snack item and can be found all over the islands from restaurants to 7-Elevens. Musubi is another word for onigiri, a Japanese rice ball, the Fujilings’ favorite food. 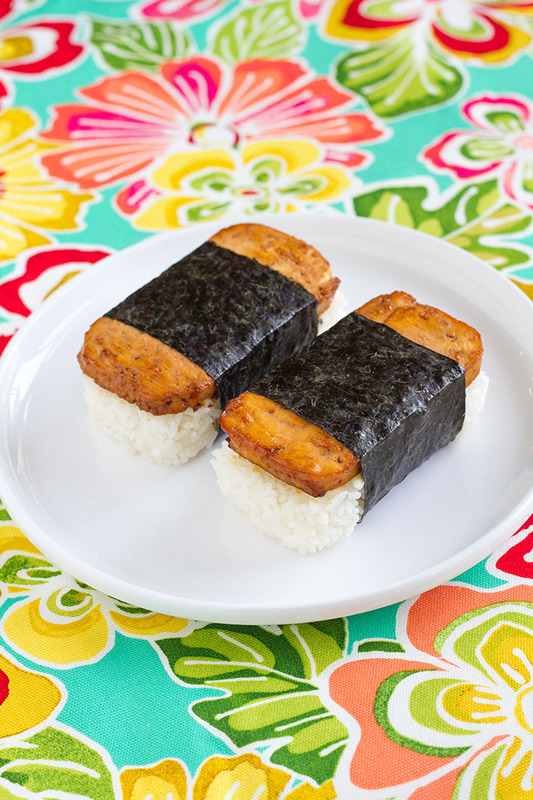 Spam musubi is made by grilling or pan-frying slices of Spam, sometimes with a teriyaki sauce added, the placed on top of a ball of rice molded into a spam shape with a special Spam musubi mold and wrapped with a strip of nori seaweed. (This is the mold I use.) Since Spam isn’t really my thing these days, I decided to come up with a healthier alternative. Enter tofu! I pressed a block of tofu, cut it into slabs, trimmed each slab down, using the mold as a pattern, then marinated the slabs in a salty, sweet marinade. Once the pieces had marinated I baked them in the oven, then proceeded to assemble my musubi like I would if I had been using actual Spam. The tofu doesn’t taste exactly like Spam, but it provides that salty, smokey, sweet meat-like flavor and texture of Spam. Delicious! Squirrel is a huge fan! I’ve already packed them several times in her bento box. If you want to do this, you can prepare the tofu ahead of time, then assemble the musubi when you’re ready to pack your bento. Drain the tofu and pat it dry with a paper towel, then place it on a large plate lined with several layers of paper towel. Put several more layers of paper towel on top, then place a cutting board on top of that. Weight the cutting board down with something like several cans of food or a book and let the tofu press for at least 30 minutes (preferably several hours). While the tofu is being pressed, prepare the marinade for the tofu. Mix the vegetable broth, tamari, maple syrup, liquid smoke, tomato paste, mirin, fresh ginger, and garlic in a small saucepan and bring to a simmer over medium heat. Remove from the heat, let it cool slightly, then strain through a fine mesh sieve and discard the solids. Once the tofu has been pressed, cut it into 4 slabs. 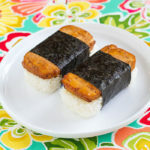 Place the musubi mold on top of one of the slabs and use a paring knife to trim the tofu around the outside of the mold. Repeat with the remaining 3 slabs. Put the slabs of tofu in a sealable container and pour the marinade over them to coat them, then seal the container. Let the tofu marinate, in the refrigerator, for several hours. Preheat the oven to 400 degrees Fahrenheit. Carefully remove the slabs of tofu from the marinade and gently shake off any excess marinade. 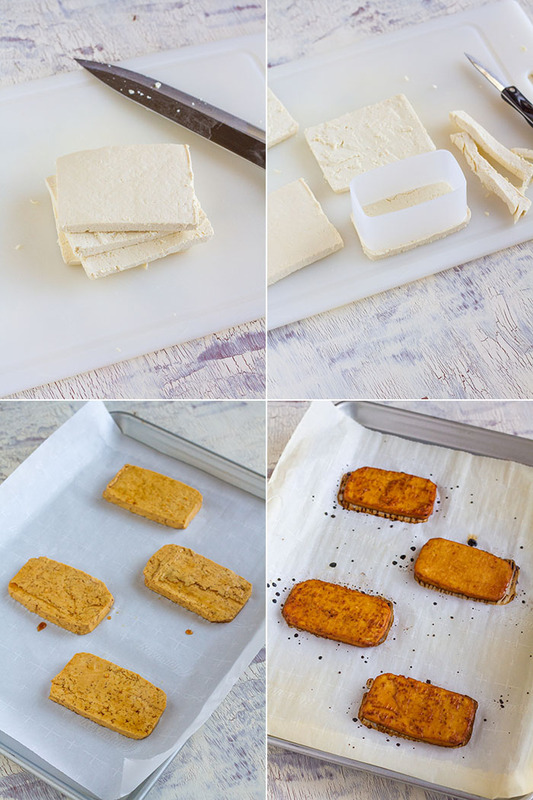 Lay the tofu on a baking sheet lined with parchment paper. Bake the tofu in the preheated oven for 15 minutes, then gently turn the pieces over, brush the tops with more marinade, and bake for another 8 minutes. Remove from the oven and let cool. Cut the nori into four 2 1/4-inch wide strips (you will have leftover nori). 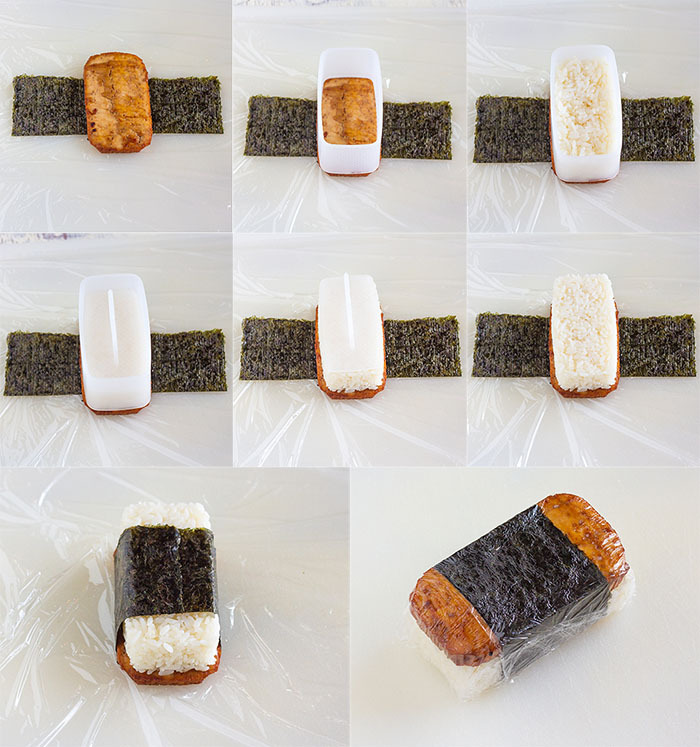 To assemble the musubi: Put one of the nori strips, a long edge nearest you, on top of a sheet of plastic wrap, with the rough side facing up. Place one of the pieces of baked tofu crosswise in the center of the nori. Place the mold on top of the tofu, matching up the edges. Put 2/3 cup of the hot steamed rice in a small bowl and toss with 1/8 teaspoon of the fine grain sea salt. Put the seasoned rice evenly inside of the rice. Place the tamper inside of the mold, on top of the rice, and gently press it down to pack the rice. Keep the tamper in place and lightly press down as you pull the mold up and off the musubi, then remove the tamper. Wrap the nori around the top of the rice, then wrap the plastic wrap around the musubi and set it aside to cool and set. Repeat the process with the remaining nori, tofu, and rice. No way! This totally looks like Spam! I grew up eating these but haven’t had one in years because I don’t eat meat anymore. Can’t wait to try this! I am a born and raised Honolulu girl and like you have lived in a lot of places since moving away from home in 1993. Spam musubi has been around and a staple for a long time, it’s not a recent thing. My maternal Granny was Portuguese and grew up on Wainaku plantation. Her oldest sister, my great Aunt, was born on that plantation in 1895 when it was just grass huts. Even though my Portuguese family is white, the white overseers on the plantation considered my family to be lower life forms and put them into housing with the Japanese and Filipinos. So my Granny and my great Aunt and their 12 siblings grew up eating musubi and my Granny was fluent in the Japanese language. They didn’t really have spam until just before WW2 and they never ate Spam musubi. Musubi on the plantation was a plain Onigiri wrapped w/nori and eaten with strips of fried egg, fish, chicken (like katsu), etc… And that was a treat they ate with their family on a sunday picnic. I went on many of those picnics as a child when I would visit the plantation. I loved the cone (Aburaage) sushi with the carrots. Mahalos for speaking about the Spam musubi. I don’t see it here in the suburbs of Philly (I just moved here after living in Silicon Valley for 12 yrs) but I do think tofu version would go well here. My husband is half Japanese and half haole. His mother grew up in Tokyo and thinks Spam musubi is despicable and she refuses to eat Spam. lol. Asian food is amazing to take pictures. I like yours much! Thank you so much Dea! Thank you for this wonderful recipe. I tried tofu musubi for the first time a few weeks back. I bought it from a nearby health food store and it while it tasted okay, I felt that I could try to make a better version. Just looking at the ingredient list, I’m sure your recipe will trump the store bought musubi. I can’t wait to try it! A quick backstory, I’m a local Kauai girl that grew up on musubi’s but haven’t been able to eat them since I started cutting meat and dairy from my diet. I’m motivated to attempt to make local food favorites I.e (Spam musubi, laulau, kalua pig) but vegan style. Thanks again. Made the musubi last night and they were great. I ate it with some ume (Japanese pickled plum) and it was delicious. I don’t miss the spam at all when I make the musubi this way. Thanks again for the recipe! This sounds great. Any ideas how to do this without a musubi mold? Thanks.